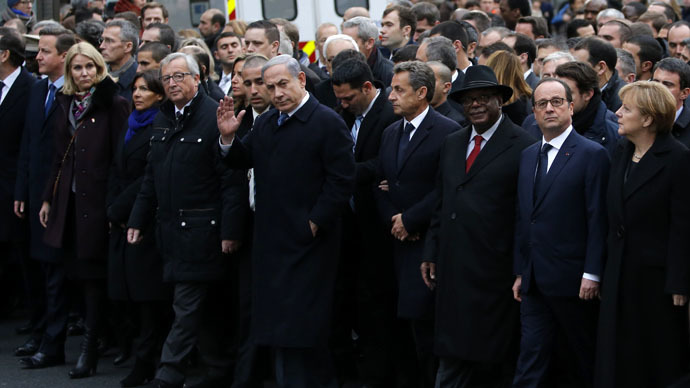 A conservative Jewish newspaper edited a picture of world leaders rallying in anti-extremism solidarity in Paris last week, manipulating female politicians, including one of the most powerful people on the planet, Angela Merkel, out of the picture. The German Chancellor, along with the Mayor of Paris Anne Hidalgo, the EU's high representative for foreign affairs Federica Mogherini and Danish Prime Minister Helle Thorning-Schmidt all vanished from the already famous photograph in the Israeli Haredi "HaMevaser" (The Announcer) paper. Images of women are usually completely absent from the conservative publication, which refers to protecting female modesty as the reason for its men-only visual world. First spotted by a religion reporter on the Hebrew-language Walla! website, the manipulation sparked condemnation in international media. Israel's oldest daily newspaper, Haaretz, called the incident "infuriating and shocking." It "deserves to be called out – like denying the fact that in the wider world, beyond the ultra-Orthodox Jewish community, women do stand on the world stage and shape events," the paper wrote in a blog. Following an attack on the Charlie Hebdo satirical magazine in Paris, in which 12 people were killed by terrorists, more people fell victims to extremists in the French capital. During the manhunt for the attackers, there were casualties in a new siege at a Paris kosher store. After going into the shop, a man armed with automatic rifles shot four people and took 16 others hostage. The women in power, marching hand in hand with other world leaders in unity and support for the victims of Paris attacks, were not just blurred. The photograph was more extensively re-edited, with images of participants moved around with women replaced by men. The rally of the politicians in Paris has already caused controversial reaction. While Israeli PM Benjamin Netanyahu has been criticized for cropping the shot of the march not to include Palestinian President Mahmoud Abbas, US President Barack Obama has been criticized for not attending at all. If they can edit Merkel out of the Paris Photo-Op, why can't they edit Pres. Obama into it? Reacting to the edited image of the rally in the Israeli paper, some jokingly commented Obama should have requested to be photoshopped into the picture to take Merkel's place. Others left the German chancellor and other female leaders in their places, but edited out all the men instead. Pictures from the historic march in Paris on January 11 became widely altered on social media. Former French President Nicolas Sarkozy made his way to the front row of the rally; his moves were spotted by internet users and he was ridiculed for being desperate for the spotlight. Dozens of photoshopped images emerged under the hashtag #JeSuisNico, which immediately began trending on Twitter.